Spring is officially here! Do you know what that means (aside from warmer weather and flowers blooming)? That means it’s time to begin your spring-cleaning, a.k.a., the act of deep-cleaning all those areas of your home that gathered dust all winter. While this may not be our favorite aspect of spring, it’s a necessary one – plus, you will feel better after it’s done! 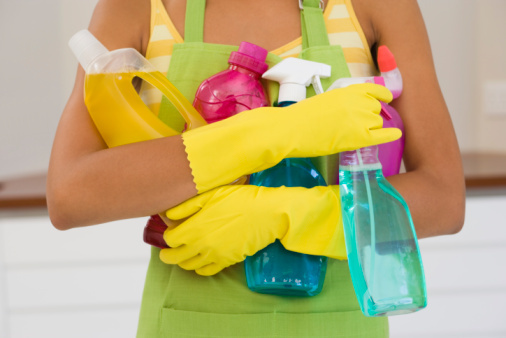 Not sure why spring-cleaning is important in your home? Here are 5 key reasons! Get Organized – You spent your winter moving around belongings that you never use anymore. Now is the time to pitch, donate, or sell all the items you know you won’t use again. Your storage closets and corners will thank you for it. Good For Your Health – Do you suffer from allergies? Getting rid of dust and cleaning out those hard-to-reach places can help keep those spring allergies at bay! Say Good-bye to Stress – When your home is clean, it gives you the ability to focus on what’s really important, not worry about cleaning! No cleaning = less stress! Always Be Ready For Guests – Having an impromptu game night or BBQ will be much easier when you don’t have to worry about doing any house cleaning! Change of Scenery – While spring cleaning, make some small changes with décor or move things around. This will help breath new life into the room! If you’re ready to start your spring-cleaning, consider our great products to help get the job done right! Our variety of microfiber rags, lint-free towels, and kitchen towels can rid your home of dust and dirt! For more information or to purchase your products, please visit: http://bit.ly/1k5iLg2 Visit us on Pinterest for more cleaning tips! Got Grease Stains? 9 Common Household Cleaning Solutions That Work! No matter how careful you are in your home, grease stains happen. These types of stains can be pretty stubborn and tough to get out of many areas in the home, especially if you’re not quick to address the issue. Luckily, we’ve come up with a list of 9 useful household solutions to help you get rid of those grease stains right away. Try one, a few, or all of the following solutions in your home! 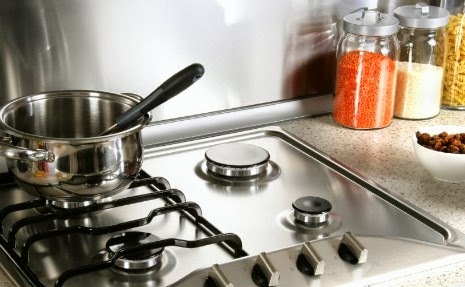 Baking Soda – Are grease stains from your cooking adventures adorning your stovetop and backsplash? Get rid of them with baking soda! First, wet the spots with a little water, and then cover them with a just a bit of baking soda. Rub them off with a damp sponge or soft towel. Keep the baking soda around to help break down the grease on dirty dishes in your dishwasher as well! Chalk – As strange as it sounds, chalk can work wonders on those grease spots in your tablecloths! Just rub some chalk on the linens and let it absorb all of the oil from the grease before you brush it off. If the stain still sticks around, just rub some chalk into it again before you toss it in the washing machine. Club Soda – Cast iron pots are great for cooking meals in, but cleaning them can be pretty difficult. Make cleanup a lot easier with club soda! Simply pour some in the pan while it’s still warm – the bubbly soda will help keep the mess inside from sticking! Cornstarch – Cornstarch isn’t just handy for cooking meals; it’s also great for getting stains out of the kitchen and carpets! Just sprinkle a bit onto a soft cloth and rub it into the grease spot gently until it disappears! For carpets, sprinkle cornstarch over the stains and let it sit for several hours. Then, vacuum it up, and the stain should be gone! Kitty Litter – Have some extra kitty litter around and looking to get rid of that garage floor oil slick left behind by your car? Just blot any wet oil or grease with newspaper until the floor is pretty dry, and then spread a generous amount of kitty litter over the stains. Let it stand for 24 hours, and then sweep it up. You should have a clean floor devoid of grease! Newspaper – Paper is absorbent, and that applies even to grease! Spread several thicknesses of newspaper over the grease spots in your garage floor, and then soak them with water and weigh them down with something heavy. When the paper has completely dried out, remove them, and the stain should be gone! Paper Bag – When you grab a bite at your favorite fast food place, you might notice that the greasy foods leave their mark on the bags that hold them. This trick works for getting those stubborn grease stains out of wallpaper as well. Just fold a brown paper bag and hold it over the stain. Run a warm iron over the spot, which should draw the grease into the paper, and repeat until the spot is gone! Shaving Cream – If you accidentally dropped some grease food on your brand new carpets, you don’t have to worry. Just grab a can of shaving cream and work some into the grease spot. Let it dry, and then rub it off with a damp spot cloth to get the stain out! Vinegar – Vinegar is great for a lot of things, and one of those tasks includes getting grease stains out of your kitchen counters or table! Just wipe them down with a cloth that is dampened in a solution of equal parts white vinegar and water. It will also help reduce and neutralize any odors on the surface – double bonus! If you’re ready to tackle those grease stains in your home or business, you’ll need some sturdy cloths to help wipe up all the liquids and grease. Let us help you with that! Find the perfect cleaning products for you at www.uswiping.com!